EDITOR’S NOTE: No national publication has a richer sports history than Sporting News, which was founded in 1886 in St. Louis and quickly became known as “The Bible of Baseball” for the way it covered America’s Pastime. Each Thursday, we’ll dip into our archives and give you a look at the iconic stars who played the game, and the great writers who helped grow the nation’s knowledge of our sport. 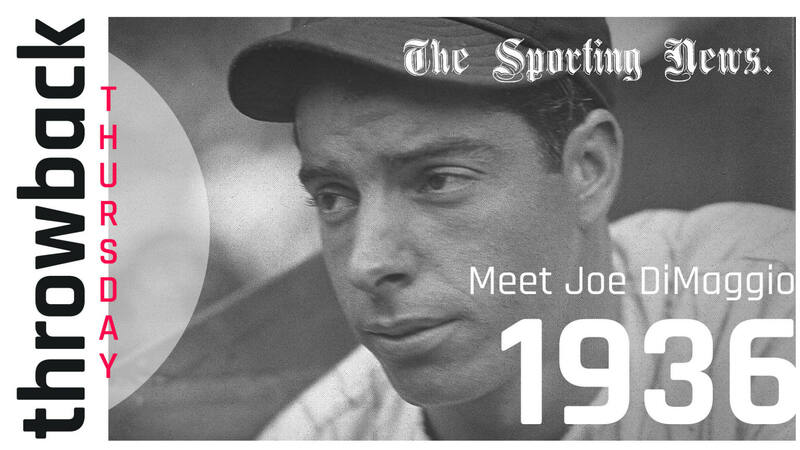 Today: Long before Joe DiMaggio earned the Joltin’ Joe nickname, he was just a kid from San Francisco who wanted to play shortstop. Dan Daniel — himself a Hall of Famer who built his reputation, in part, with his unforgettable reporting on Yankees legend Babe Ruth — was there for DiMaggio’s first spring training with the Yankees. It’s safe to say Daniel was impressed, comparing the 21-year-old rookie to legendary batsman Joe Jackson in a column that introduced the budding star to the American public. Unfortunately, the nickname “Shoeless Joe DiMaggio” never stuck. Fortunately, TSN used a picture of DiMaggio showing off his biceps as the art. Outstanding. Joseph Paul DiMaggio, Jr., faces no easy task with the Yankees. Hailed as the greatest minor-league star of 1935, flattered with the announcement that but for having been sold to New York, the Red Sox would have paid $60,000 for him, confronted with the fact that Yankees fans regard him as the Moses who is to lead their club out of the second-place wilderness, in which it has wandered for three years, he is more in the limelight than any other major league recruit. In fact, Giuseppe, as Bill Duncan pointed out in his comparison of highly touted phenoms from the Coast, in a recent issue of THE SPORTING NEWS, is decidedly on the spot, but from early indications, it appears he will live up to his boosters’ predictions. DiMaggio certainly created a furore in his first two games with the Yankees, against the Cardinals. Sam Breadon and Frankie Frisch went into estacles over Giuseppe, and so did John O. Seys of the Cubs. In the pair of contests with the Redbirds, DiMaggio got six hits for .666, smacking a tremendous triple in each. At Bradenton, the three-bagger went to the 420-foot mark on the right-center field fence. Joe followes this performance by getting four hits in a game against the Reds, March 20, giving him a total of ten hits in 16 times at bat, for the impressive mark of .625 for three games. During that period he faces three right-handers and three southpaws, getting five hits against each style of flinging, and his drives went to all fields. The Yankees bought DiMaggio at the minor league meeting in Columbus in November, 1934. Joe had injured a knee getting out of a taxicab the previous summer, and this left his future in doubt. The New York club purchased an option to take DiMaggio for $25,000 in cash and five players. DiMaggio was left with the Seals. Last summer, the deal was closed—much to the chagrin of the San Francisco flub, which had that offer from Eddie Collins before it. Joe is one of nine children. He has four sisters and as many brothers. Dominic, 19, plays bush ball around San Francisco and Joe says he is a comer. Vincent is an outfielder with the San Diego Padres of the Pacific Coast League. Vince is Joe’s senior and was with the Seals when Joe broke in. When Joe was only a year old, the family moves from Martinez to San Francisco. Joe’s dad was a fisherman. Now, at 67, he is retired, and a close student of baseball, about which he knew nothing until a couple of years ago, when he became a hot fan. At 14, Joe lost interest in baseball. He went in for tennis in a big way, and played basket ball, and “touch” football. When his brother Vince hooked up with the Seals, and made good, Joe began to think things over and went back to baseball intensively. He joined the San Francisco Boys Club, then played for the Mission Red A’s, all at short. With his brother on the Seals, Joe began to haunt the knotholes at the San Francisco park. However, he had aroused the interest of Spike Hennessey, scout, who hauled Joe into the Seals’ office, where Charley Graham told him there was no need of his peeking through knotholes, and handed him a bunch of passes. Graham asked Joe to work out for a few weeks with the Seals. Near the close of the season, Augie Galan got permission to go to Honolulu, so Joe played in Augie’s place in three games. That was 1932. Joe got two hits in nine tries, and remembers that his first safety, off Ted Pillette, was a triple. Joe reminds one of Joe Jackson at the plate—standing with one foot back, with his feet 12 inches apart. He swings a 40-ounce bat, 36 inches in length—one of the biggest bats used by any major league player, even heavier than that of his teammate, Lou Gehrig, whose club weighs 39 ounces. Al Simmons, who was induced by Mickey Cochrane to lighten his bat to 33 ounces, uses a 37-inch length. The average mace weighs 36 ounces and is 35 inches long. Joe meets the ball at the last possible fraction of a second. Most of his hits are pulled. He has a remarkable arm, as evidenced by his 36 assists last season. That total was achieved in spite of the fact that for the last month of the campaign he was handicapped by a cold in his arm. His throwing and fielding has measured up to expectations in exhibition work this spring. Among his 1935 feats was a drive over the 420-foot left field fence in San Francisco—the longest in Coast league records. He scored 171 runs and drove in 151. Joe got 34 homers and was voted the most valuable player in the league. Joe likes movies, but hasn’t much use for books. He also likes spaghetti, even though his new teammate, Tony Lazzeri, doesn’t care much for Italy’s favorite dish. Although DiMaggio regards Joe Cronin, another Californian, as his baseball hero, he credits Frank O’Doul, his manager at San Francisco last year, with giving him his greatest help in the game.